Barbara Murchison, California Department of Education’s ESSA state lead, addresses the board Wednesday. The California State Board of Education voted Wednesday to approve its plan to comply with the federal Every Student Succeeds Act, culminating a year and a half of work with dozens of public meetings and comment periods. Whether it will be accepted, however, is far from clear. The plan is required under the new federal law enacted by the Obama Administration to explain how the state will spend money on and improve outcomes for low-income students and English learners. During its meeting Wednesday, the state board made a few changes to its draft plan that was released in August. Most of the changes were technical, but a one-word tweak to the definition of an “ineffective teacher” essentially widened the pool of teachers who would be deemed effective. Two board members voted against the state plan. California is required to submit its plan by Sept. 18, as will 30 other states. Several states submitted their plans earlier this year. Board President Michael Kirst began the discussion by outlining the work that is left to be done after the state plan is submitted to the federal government. One aspect is developing applications for districts to apply for federal funds. The state also has to submit how it will identify the bottom 5 percent of the state’s lowest-performing schools. It plans to submit a follow-up document to the state plan in January. “It bothers me that a lot of critics, including people from outside the state, look at only our state plan and they don’t look at all of this context, some of which is very important as well,” Kirst said. Bellwether Education Partners was one group that released a critical report of California’s plan saying it wouldn’t meet the minimum federal requirements. Education advocacy organization Children Now was also critical of the state’s plan and predicted parts of it would not gain federal approval. U.S. Secretary of Education Betsy DeVos’ department has rejected some plans that did not set ambitious enough goals. State Board of Education President Michael Kirst on Wednesday. But Kirst and other state officials contended that the plan will meet federal guidelines. California education officials have viewed its ESSA plan as a compliance document with the federal government, calling it essentially a grant application.The plan is needed in order to receive federal funds. California receives about $8.1 billion in federal funds, out of a total $92 billion state education budget. Of the federal money, $2.5 billion is covered by ESSA. 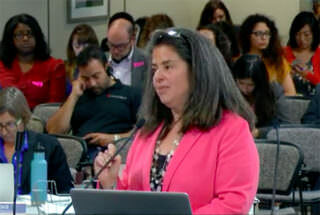 Board member Feliza Ortiz-Licon, who voted against approval of the plan, appeared frustrated that she couldn’t convince her colleagues to put in stronger language around how achievement gaps would be narrowed. 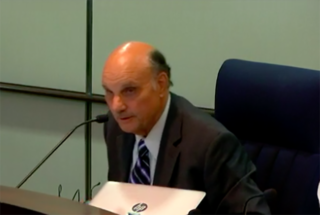 Ortiz-Licon noted the plan would likely outlive the board members because the federal education law may not be reauthorized for 10 to 15 years. One of the changes from the August draft plan involved the definition of an ineffective teacher. The federal law requires that states report whether low-income students are disproportionately taught by uncredentialed, misassigned, and ineffective teachers. The board voted to remove the word “full” from the definition that a teacher must have a full credential to be considered effective. Under that definition, intern teachers would not have been considered effective. The state received lots of feedback from stakeholders on this topic, including from Teach for America, whose corps members are intern teachers. Board member Patricia A. Rucker, who also voted against the plan, said she had hoped to address the distribution of ineffective teachers and how districts would be held accountable for having an unequal proportion of unqualified teachers at low-performing schools. She said she hoped the conversation would happen after the plan was submitted as districts are developing their LCAP spending plans. “The fact is interns tend to be collectively placed at some of the lowest-performing schools, at some of the hardest to staff schools, and some of the hardest to teach subjects with students who would be considered our priority students,” Rucker said. Some groups, like The Education Trust-West, didn’t think the definition of an ineffective teacher was strong enough because it doesn’t take into account a teacher’s ability to affect student outcomes. Brian Rivas, director of policy and government relations for Ed Trust-West, said he believes the state’s ESSA plan was a way to pursue civil rights for low-income students and students of color. “We’re disappointed. We think this is a missed opportunity to weave together all of the disparate parts … to move the needle for students who need the most help,” Rivas said. The CDE received 368 letters, many of them form letters, from organizations and individuals about the August draft plan. Most of the comments had to do with including visual and performing arts curriculum references in the state plan. Most of the public comments the board heard Wednesday were about the definition of an ineffective teacher. Another change to the plan that was approved was a technical change that made clear that lowest-performing schools would be identified by high schools that had a graduation rate of 67 percent or less in addition to schools that have all red indicators on the state Dashboard or one orange and the rest red. It will likely be several months before the state hears back from the federal government about its plan. After the state submits its plan by Sept. 18, California and U.S. education officials will have a two-hour closed-door meeting to discuss the plan and any issues the federal peer reviewers had. Then the feds will provide formal feedback to the state. If the state sticks to its guns about some of the aspects of the plan, there could be a drawn-out battle between state officials and the federal government.